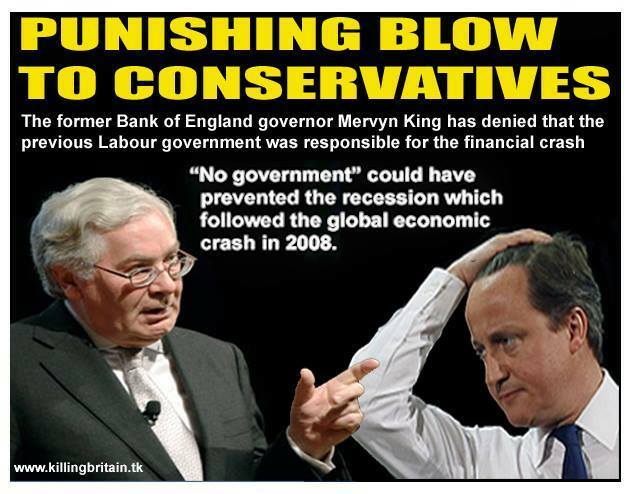 ‘Killing Britain’s interpretation of Mervyn King’s comment on the recession. … That’s the opinion of Simon Wren-Lewis, writer of the Mainly Macro blog. It’s his response to the oft-asserted claim that Labour crashed the economy; he can’t deny it altogether because Labour’s failure to regulate the banks does make it partly true, in his eyes (we’ll skate over the fact that the banks had a certain responsibility in that area themselves. Now we know they’ll never behave responsibly it makes the future a little easier to navigate – or at least, it should). Professor Wren-Lewis writes: “That is I guess why Ed Miliband seemed to respond to this accusation by saying something like: “yes we did get financial regulation wrong, but …”. That may be an honest reply, but it is not very effective, because many will read it as admitting Labour caused the recession. “As Mervyn King says, “the real problem was a shared intellectual view right across the entire political spectrum and shared across the financial markets that things were going pretty well”, a view which he of course shared. The reason? “The coalition made such a bad mistake with austerity… Losing the equivalent of at least £4,000 per household is a big deal. Read the full article on Mainly Macro. It is plainly written and even shows how you can measure up the Coalition’s performance against Labour’s for yourself. pointing you towards the best information on the economy. It’s hard to control banks when they threaten to trash the money supply at the snap,of their fingers. ?What a load of nonsense.What I can’t understand is why the Labour Party can’t come out fighting on this issue?In the US many bankers were put in prison for illegal dealings they cooked up however over here they just had to say sorry?…It doesn’t make sense.The part the Labour Party were guilty of was to back down when the banks threatened to shut every ATM down and close every bank overnight and this was being done to the Chancellor! !…..in the past if you’d said that to any Minister of the crown it would have been considered treason and those responsible would be still in prison until they rotted…. But surely it was Mrs Thatcher’s government which STARTED de-regulating the banks and setting the ball rolling! I clearly remember debates on news programmes in which Fatty Lawson was up against French and German Chancellor’s who were opposed to de-reg. Lawson and others regularly said that we were following the American example, and those who did not were being old fashioned and protectionist. I clearly remember the French and German Chancellors repeatedly warning that this was not safe. I know diddly squat about economics, but their warnings made more sense to me than Tory claims of “old fashioned” and “keeping up with America”. Yes, Labour continued de-reg, but may not have done had Tories not STARTED the process. Can you reference this comment please. The US did not put many bankers in prison. There were a few slaps on the wrists with meaningless fines but mainly they were promoted. It was Iceland that bravely took on the bankers and refused to bail out the banks. And now they are considering legislation to centralise the banks so that money creation is not controlled by the private banks who create it out of thin air and then charge interest. Iceland did bail out its banks. It’s what happened afterwards that is interesting; the personal accounts of Icelandic citizens were saved while the parts of the banks that were responsible for the huge losses and debts were allowed to collapse. Well after 5 years cameron claims he has 4 weeks to save the economy, what has he been doing for the last 256 weeks? I’m reposting on Facebook and Twitter some of the more significant articles of the last few years, so readers can see for themselves. And they immediately put a stop to it once they were in office in 2010, and pretty much straight away, the economy started flat-lining. And it kept flat-lining for the next three years, because the pump was no longer being primed. When people only say ‘Austerity is unnecessary’, I actually roll my eyes, because it implies that things would have gone much the same way without it, when in fact, things would have improved far more quickly without it. (It’s kind of like saying, ‘The iceberg did nothing to speed up the Titanic’s arrival in New York.’) It’s a point that needs to be drummed home that Austerity isn’t just unnecessary, it is actually harmful and counter-productive. Not just to ordinary people either, it has a toxic effect on the entire economy. I like your iceberg/Titanic comparison very much.